1. Make the shrimp: Bring 2 quarts (2 L) salted water and the lemon slices to a boil in a large saucepan over high heat. Add the shrimp and cook until they turn opaque, about 3 minutes. Drain and rinse them under cold running water. Transfer them to a bowl and refrigerate until they are chilled, at least 1 hour and up to 1 day. 2. Make the broth: Process the orange zest and juice, lemon juice, tomato, onion, garlic, habanero, and honey in a blender until smooth. With the blender running, gradually pour the oil through the hole in the lid to make an emulsified broth. Season it to taste with salt. Pour it into a medium nonreactive bowl, cover, and refrigerate until it is chilled, at least 2 hours and up to 1 day. Whisk the broth well before using. 3. To serve, stir the shrimp, avocado, tomato, orange, and cilantro into the broth. 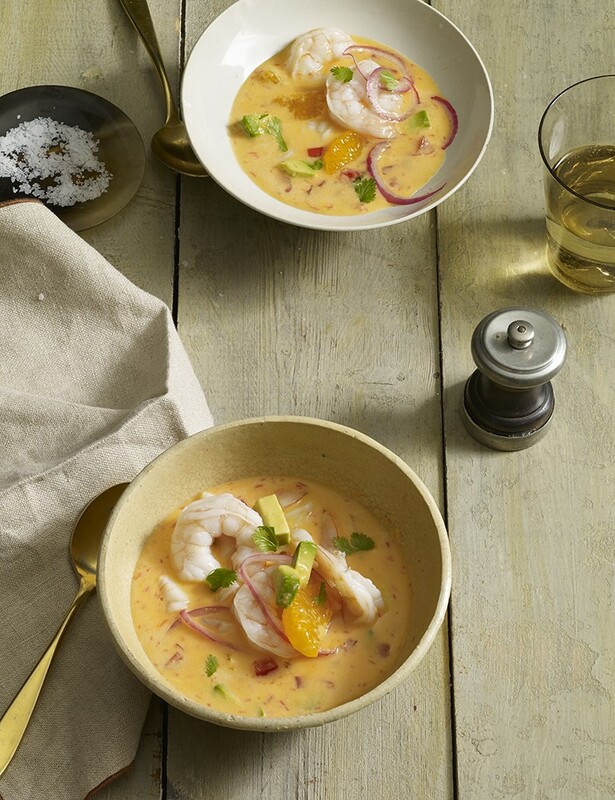 Divide the shrimp and broth equally among four wide soup bowls. Top each with three pickled onion rings and serve them immediately.